You can't escape the ape! 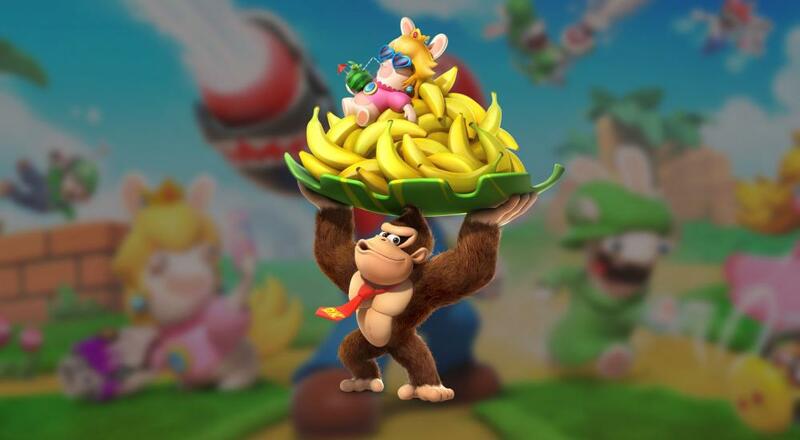 Donkey Kong has been slated to participate in Mario and Rabbids Kingdom Battle for quite some time now, but the details of when it would happen and exactly what that entails were unclear. Thanks to a recent Ubisoft announcement, we now know that the "Donkey Kong Adventure" DLC is due out sometime in June, as well as a few other things. For starters, the announcement revealed that two new playable characters will come with the pack: Donkey Kong and Rabbid Cranky. No Funky Kong, sadly, but I'll take as much of the DK Crew as I can get. The adventure itself will take place in a Rabbid-fied version of DK's typical environs and should require about ten hours to fully experience. Along with the standard tactical battles, Ubisoft is also saying some light puzzles will impede the player's progress from time to time. Rabbid Cranky and Donkey Kong seem to slip into the type of combat roles you'd expect. Cranky targets enemies at range and utilizes a "Long Story" ability to put them to sleep, while the angry ape himself specializes in being up close and personal, as well as being able to throw just about anything on the map. That's right, even cover and enemies. "Donkey Kong Adventure" will be free to Season Pass holders and available to purchase on a standalone basis. While it doesn't appear that the DLC will feature co-op gameplay, Mario and Rabbids Kingdom Battle does allow for two player local co-op in a series of challenge modes. If you've exhausted those, I'm of the opinion that tactics games can easily be enjoyed with a partner, so there's nothing keeping the two of you from cooperatively guiding The Good Sir Kong to victory. Page created in 0.7978 seconds.